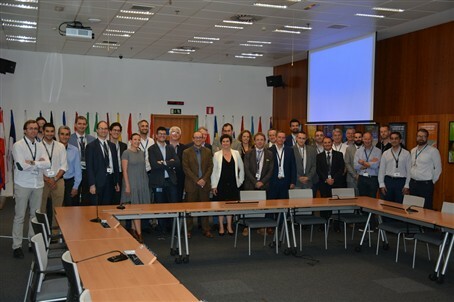 The participants of the first wall panels workshop held at the seat of Fusion for Energy, Barcelona. In the core of the ITER machine the temperature of the fusion reaction will reach 150 million ° C. To protect the surface of the vacuum vessel, which will be exposed to the super-hot gas, a layer made of 440 first wall panels, resembling to heavy metallic tiles, will “dress” it from top to bottom. Each of these panels measure 1 x 1.5m and weigh up to 1.5 T. Together with shield blocks installed behind the panels they form the “blanket” as it is known in the ITER jargon. Europe is responsible for the production of 215 of these panels. During the last three years, F4E has been laying the manufacturing foundations of these critical components through its collaboration with: i) AREVA N.P, ii) ATMOSTAT (group ALCEN); and iii) a consortium consisting of IBERDROLA, Wood (formerly AMEC Foster Wheeler) and LEADING Enterprises. All of them have completed the testing of materials and bonding techniques, and produced semi-scale prototypes which have successfully undergone high heat flux tests. Since then, they have taken a step forward and are in the process of producing full-scale prototypes. F4E took the initiative to organise a workshop to help them network with companies specialised in automation. Following a market survey, conducted by F4E, six companies from all over Europe were invited to present their skills and expertise. Through presentations and bilateral meetings, automation companies and manufacturers were invited to explore how the manufacturing costs could be decreased and quality could be improved the moment Europe starts producing its share of first wall panels. “This first workshop gave us the opportunity to introduce the ITER project to new companies, explain in more detail the technical requirements of the first wall panels, one of the In-Vessel components, and move from the stage of prototypes to an industrial phase” explains Stefano Banetta, F4E’s Technical Responsible Officer following this component.